I need to rant about Ned Yost’s performance tonight, but there are two things I need to address before I do so. First, I have been a Ned Yost defender all year long. I don’t join in with the #Yosted banter because it’s mostly just hypercritical fans who like to gripe. I think Ned does a great job managing a clubhouse and getting the best out of his players. He understands the longview of the baseball season. He maintains his emotions and has proven now that he can motivate a team through 162 games and beyond. I think that has way more to do with managing than any strategic decision a manager ever makes or doesn’t make. 1. Communicate with the front office. 2. Earn the players respect. 3. Keep players focused for 162 games. 4. Keep players motivated for 162 games. 5. Keep politics out of the clubhouse. …no strategy needed. Just facilitate a healthy and happy clubhouse for a whole season. That’s 95% of managing in my opinion, and it’s not easily done. It takes the right kind of individual to manage 25 or 40 grown men with grown egos. And let’s be honest, if any of us did 95% of our job well, we’d be pretty highly valued in our careers. But Ned Yost isn’t valued in baseball. In the 2014 postseason, Yost has faced Bob Melvin, Mike Scioscia, Buck Showalter and now Bruce Bochy. All of those men are loved by their fans, city and by baseball. Ned Yost – a “dunce” according to the Wall Street Journal before the ALCS – has beaten them all. Even Bochy early in this series. The issue with Ned? The extra 5% of his job is the most public. And he’s admittedly not the greatest at that portion of the game. Yet I have continued to defend his managing, because I believe strongly in the other 95%, and have the ability to overlook the various “miscues” he has had this year. Even with those, Yost gets an unfair wrap because no one ever applauds the manager when they make the right choice. We only criticize when the manager makes a mistake. We praise the ballplayers, but we point fingers at the manager. It’s a tough job and I don’t envy anyone in that position. Which brings me to my second pre-rant point: whether Ned Yost makes the right or wrong choice, it is still the players’ job to produce on the field and at the plate. Managers only have so much control over the outcome of a game. Ned said it himself after he brought in Ventura in the Wild Card game – a decision that he now claims to have learned a lot from – just because it doesn’t work, it doesn’t mean it was the wrong move. So before I take off here, I want us to all understand those two points. I have defended Yost because managing a ball club is much more than strategy, and the players ultimately dictate the success or failure of a team and its manager. That said, I’m about to go off on Ned Yost’s managing in Game 5 of the World Series. The grumbling began in the bottom of the 4th, and the questioning began in the top of the 5th inning. The Giants had already scratched 2 runs across. The first came in the 2nd inning when Hunter Pence led off with a single and went to second after Brandon Belt took what the Royals’ defense was giving him by beating the shift, dropping down a bunt single. Both runners advanced when Travis Ishikawa flew our to Jarrod Dyson – rough night – in deep centerfield. Both runners advanced, and Pence scored on a Brandon Crawford groundout to make it 1-0. The second run came in the 4th off of three singles that managed to find daylight. Pablo Sandoval singled to left. Then Escobar alligator armed a groundball in the hole off the bat of Ishikawa. Then Crawford blooped one toward centerfield – Dyson, coming in hard, couldn’t get there in time and had to play it on a bounce. He didn’t field it cleanly allowing Sandoval to score from second. Which is what started the grumbling. Fans were frustrated that Dyson was in centerfield instead if Lorenzo Cain, as if Cain could’ve made the catch and prevented the run from scoring. Which simply isn’t true. Centerfield is massive at AT&T Park, and if Dyson couldn’t make that catch, then Cain couldn’t either. Statistically, Dyson is actually the better outfielder, which is just hard to wrap our minds around since we have seen so much flashy brilliance from Lorenzo this fall. But it’s true. However, Cain probably wouldn’t have bungled it off his mitt, so perhaps Dyson did allow a run. So be it. Ned went with his best defense and it let him down. The Royals had only gotten two hits at this point – one from Lorenzo and one from Salvador Perez – both singles. With one out, Omar Infante smacked a double to center, and the Royals seemed to be in business. Except up next came Dyson and Shields. Some would’ve rather seen Josh Willingham, Nori Aoki or Billy Butler here instead of Dyson. A pinch hitter wouldn’t have gotten much to hit with the pitcher spot coming up next, and first base open. Pinch hitting for Dyson would’ve made a lot of sense, followed by the other one hitting for Shields next. You don’t get many chances off of Bumgarner, so it’s important to be aggressive when you have any slight ray of light. Instead, Ned stuck with Dyson and Shields who both struck out to end the inning and the “threat.” Felt like a missed opportunity. Of course, right on cue, Ned turns out to have seemingly made the right call. With runners on 1st and 2nd and two out, Hunter Pence hit a shot to the gap in right-center. Lorenzo Cain, as we have come to expect, made great catch running back and to his right saving two runs and ending the threat. It was a catch that Aoki or Willingham would never have made in the same position. Point, Ned. Not only that, but Shields lasted another inning, saving the bullpen and keeping the Royals in the game. At this point, thanks to Cain’s catch and Shields’ quality start, the “dunce” was done just fine. This is where the wheels really came off. The inning began with a double switch: Kelvin Herrera came into pitch, occupying the #7 spot in the lineup instead of Omar Infante, and now batting in the pitcher’s spot and taking over at second base would be Jayson Nix. First of all, it’s baffling to me that Nix is even on this team over utilityman, Christian Colon. Nix still hasn’t tallied a hit since joining the Royals on August 30. He’s now 0-10 as a Royal. Meanwhile, Christian Colon is just as good defensively, faster on the bases, and hits the ball much better. Unless Colon’s finger wasn’t 100% following his injury, Nix has no business even being on this roster. But here we are, and he is. And he was suddenly lined up to bat 2nd in the 8th inning. In Game 5. Of the World Series. My biggest issue with the move isn’t Nix as much as it is the timing of the move by Yost. For some reason, Ned felt it was of the utmost importance for Herrera to throw multiple innings down 2-0, otherwise he would’ve just let Herrera takeover the #9 spot for Shields instead of pulling the double switch. If Ned had waited an inning to pull the trigger, he could’ve sent Herrera out for the 7th, pinch hit Billy for him in the 8th, and then brought in Wade Davis to start the 8th and done the double switch then. 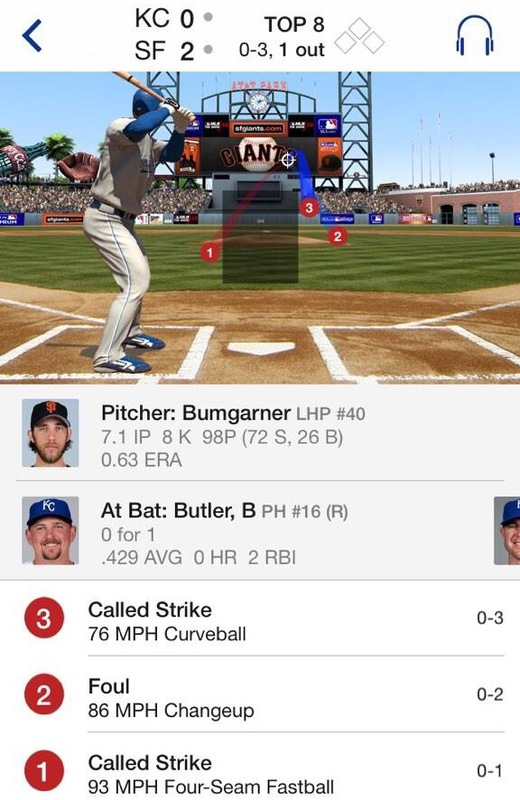 …yet they were all three strikes. Our best hitter off the bench was done after three crummy pitches. Then up comes Jayson Nix in the pitcher’s spot. He’s the last infielder on the team, so you can’t pinch hit for him and he goes quietly flying out to left field. Escobar struck out to end the inning. Pitiful all around. Nori goes out to play right and Cain moves to center, and Herrera comes back out to throw the 8th – which is still a dumb idea – and he promptly gives up two singles to Sandoval and Pence. Which forces Yost to go to Wade Davis anyway, just with 2 on and none out. Wade struck out the side, but not before the Giants plated 3 insurance runs spearheaded by a Juan Perez double off the centerfield wall. Suddenly the game had been blown wide open. It was 5-0 Giants, which is how the game would end. 1. Don’t double switch. Give Herrera the 7th and that’s it. 2a. Pinch hit for Dyson with Billy Butler. 2b. If he gets on, pinch run with Gore. 3. Pinch hit Aoki for Herrera. Sure, Aoki is 0-16 lifetime vs Bungarner, but hitless against MadBum is better than hitless against the whole league (Nix). 5. Finally, execute the double switch. Nori for Dyson (Cain moving to CF, Nori out to RF) and bring in Davis to start the 8th with his spot in 8 spot now occupied by Billy/Gore. That way Davis – who rested yesterday and has a day off tomorrow – could pitch his normal 8th inning and not come in later with runners on base. That way you get Aoki’s bat instead of Nix’s. You keep Infante in the game. You give HDH the innings they’re used to throwing. You would also save a bat for later on the off chance you happened to tie it up and things went later. This is NL Managerial Strategy 101 here. It’s not complicated stuff, yet Ned Yost biffed on it entirely. Of course, the players probably wouldn’t have come through anyway. The damage had already been done. But this sort of thing is the extra 5% that the manager needs to get right to be considered great. The manager’s job is to put his players in the best position possible to succeed, and Yost didn’t do that at all in Game 5. Would we still be down 3-2 coming back to KC? Probably. But in a game that looks like a 5-0 blowout on paper actually came down to a handful of little mishaps. Championship baseball is in the details, and Ned Yost hurt his chances for the first time in a while. Love your observation, I think you’re right on point of what I was thinking while the game was going on. I really think they could have held it to a much more respectable 2-0 (which looks much better on paper) differential just by starting Davis in the 8th rather than letting Kelvin start that inning. Also, I would have liked to see Dyson bunt in the top of the 5th (which royals haven’t done in a while) and use his speed to try and get 2 guys on. That still left Shields up to bat, but I would rather have seen that situation rather than Dyson swing away. Seems that could have been an inning to get a bit of a spark going. Anyways, those were the 2 things that I was yelling at the TV about along with last nights game. Previous Previous post: World Series Primer & Predictions: If baseball is designed to break your heart, why does KC feel like THIS?